It is very light, weighing approximately twenty ounces. The Leg Support component which is made of ABS High Impact Plastic will hold up to eighty five pounds The cane will support up to three-hundred pounds. 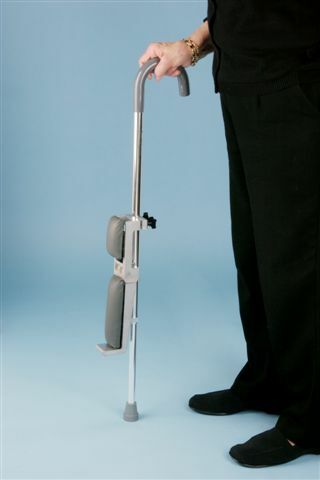 The leg rest component snaps down easily for use as a standard cane. Doctors are prescribing this device to their patients. 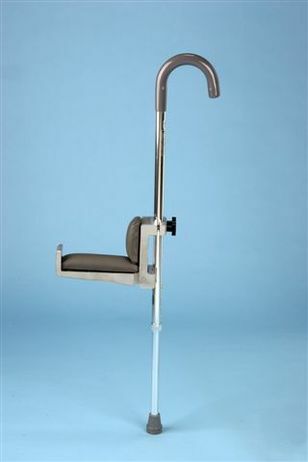 The Leg Support component has two soft pads; one to support the bottom and the other to support the side of the Leg, Knee or Foot allowing the user to sit for long periods of time whether it be seated at a desk, dinner table, in a doctor’s office, on a couch, folding chair, in a library, theater seat and for anytime a user requires his or her leg to be supported and rested in a horizontal/or elevated position while seated.. The Cane Leg Support can easily be adjusted up or down to accommodate any height requirement. 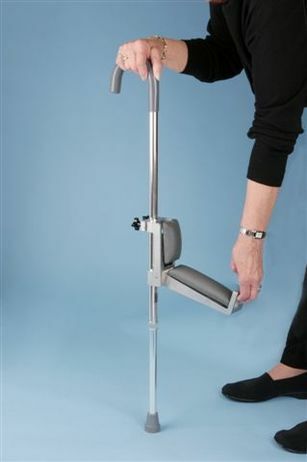 Once the Cane Leg Support is adjusted to the correct height, the cane is moved to a centered position beneath the leg, and the Cane Leg Support becomes perfectly balanced allowing the user to sit and keep the leg in a horizontal/or elevated position comfortably for hours. The entire Cane Leg Support is very light, weighing approximately twenty ounces. The Leg Support part which is made of ABS High Impact Plastic will hold up to eighty five pounds and the Cane will support up to three-hundred pounds. It is marketed on the Internet through my company J&M PRODUCTS LLC, listed under CANE LEG SUPPORT. With very little effort, we’ve sold about 1700 over the Internet. My company, J&M PRODUCTS LLC is in the Electronic components business, not the Medical Equipment business and this invention would be best served in the hands of a Major Medical Equipment Distributor where the marketing potential would be unlimited. My patent attorneys performed a search and confirmed it is the only medical device of its kind, so the purchaser of this device will be the sole marketer of the CANE LEG SUPPORT. The Cane Leg Support is used for basic comfort or for persons having a permanent Leg, Knee or Foot disability, or are recovering from a Leg, Knee or Foot operation and must keep their leg in a horizontal or elevated position when seated. Orthopedic Doctors are prescribing this device to their patients. The sale will include..Domain name, Patents, inventory approx. 950 ready to ship packaged units. Website. literature and all related information.